If you type a few letters into the search field over at the Internet Movie Database, you might notice how fast it is. That’s because they’re not served dynamically from their primary servers. 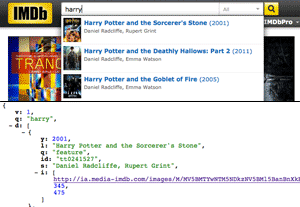 IMDB, instead, serves the JSON data for search suggestions from a CDN, resulting in a significant speed boost. They use pregenerated static files to make this possible. They only seem to have result sets for 4-5 character inputs, though. So you can query “ince” but not “inception.” The latter will result in an error. I guess most searches common enough to be matched in the suggestion box are covered within that limitation. It’s a clever implementation, and it has to save a lot of computing power on a site that large, in addition to being fast. Since everyone else is making instant searches, I took an hour or so of my time and whipped-up an Instant Twitter Search for the fun of it. Microsoft recently launched their new search engine “Bing,” in an attempt to compete in the arena that Google has pretty much already won. There was a bit of talk leading up to the relatively quiet launch, which promptly disappointed me. Yahoo is currently readying the next major update to it’s BOSS Search API. With it they will bring access to SearchMonkey data, optional longer abstracts, and greater flexibility for monetization. They will also be tracking API usage, and charging nominally for monthly usage greater than 10,000 queries. It seems reasonable, and Yahoo certainly is improving upon the service. Ten thousand queries for month is a pretty fair ceiling in my opinion. It’s plenty for experimentation or development, or even a web app of reasonably small size. If Yahoo can leverage BOSS to save themselves from possible bankruptcy, and still have a unique and powerful service, that’s definitely fine by me. Now pay attention Google: You dumped your API back in 2006, and it’s going to come back to haunt you unless you follow Yahoo’s lead. After a long draught, Yahoo’s getting their game back on, and they’re out to with the developers over with all of their tools. “Live Search” is a term that people started using somewhere along the line to refer to AJAX-y search forms that display results as you type, rather than taking you to a results page. Kind of like Apple’s Spotlight search in OSX, which I have to say works great. Wouldn’t it be cool to have something like that on your blog? A search form that, as you type, displays the results in a dropdown instead of a results page? That’s where Sikbox comes in. Sikbox is a Yahoo BOSS app that allows you to create a cut and paste live search solution. It’s free, easy to install, and you can even apply your own CSS styles to it (or pick from one of the pre-made themes). You can search the entire web with it, or limit it to your website, like most of us would probably do. If you click on one results, you jump right to it. It works pretty good. It seems to work a lot better than the default WordPress search system too (providing your blog is in the Yahoo index).